Some tools should be simple. The Sins Mod Manager aims to be just that. 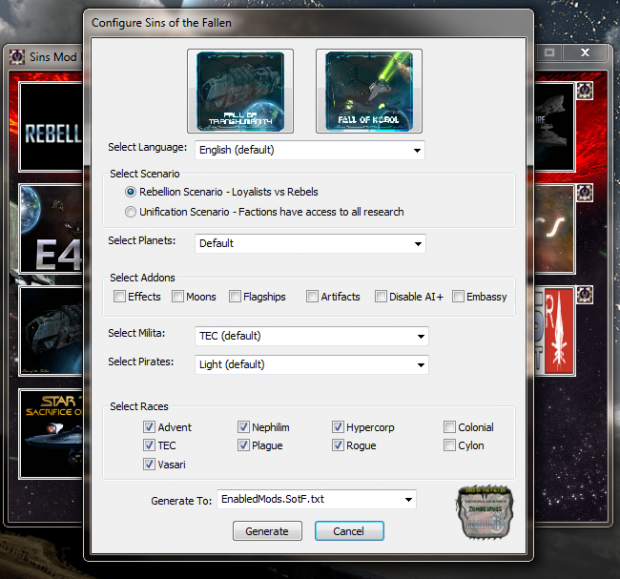 The Sins Mod Manager maintains multiple EnabledMods text configurations (think templates) and allows you to activate the one you want prior to starting Sins of a Solar Empire: Rebellion. It won't download, install or modify any of the mods shown. It's up to you to ensure the mods are downloaded and installed properly in order to play them. Simply click on the mods picture and it will copy the EnabledMods. [Mod Name].txt to EnabledMods.txt. If the EnabledMods. [Mod Name].txt doesn't exist yet, then the tool will create it for you. What's up with the little icon next to the mod's picture? 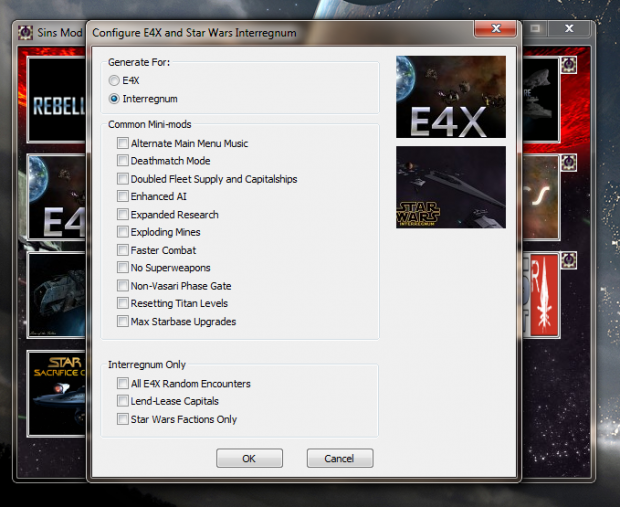 Clicking the mod configuration icon will create or regenerate the EnabledMods. [Mod Name].txt for the corresponding mod. 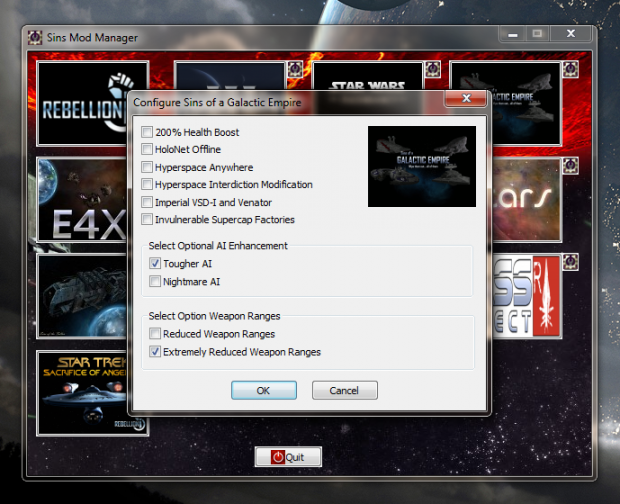 If the mod has optional configurations another dialog will be displayed to select those options (see below). Why does Windows not trust the executable? It costs money to sign an executable. As this is a free mod tool I won't be spending money to sign it. You can trust it or not trust it at your discretion. My suggestion is only use versions downloaded from moddb and verify the checksum matches what moddb displays. 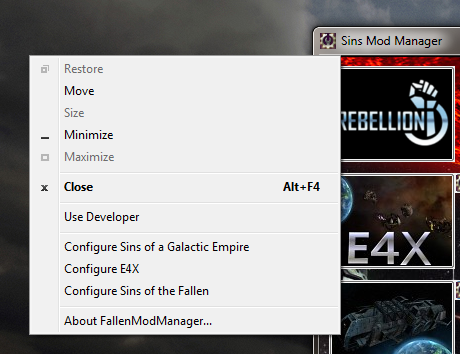 The Sins Mod Manager system menu allows you to optionally select "Use Developer" to have this session manager the EnabledMods.txt for the Developer Exe. Note: this option will not be persisted across executions. That is just awesome Zombies! Indeed, fantastic work! This should be a real help to anyone new to modding. 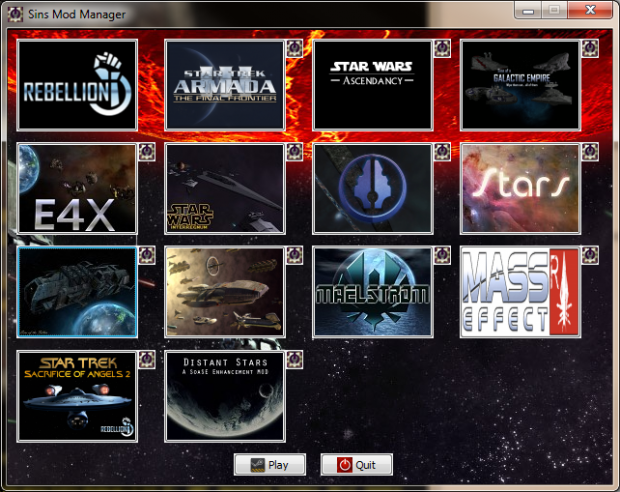 The mod manager has been updated to install mods. Let me know if there's any improvements or enhancements that might be cool. Cool tool, Zombie. Just used it, works fantastic. Have a cookie.